Balance Catamarans is a story of passionate invention and collaboration between some of the world’s finest and most storied catamaran designers and builders. Our team of designers, engineers, and builders came together to craft the finest adventure catamarans on the planet. At Balance we are hard-focused on achieving a perfect harmony between comfort at anchor as well as safety and performance underway. We neither set out to produce charter cats or racing cats, but high speed bluewater voyagers of uncompromising quality. We know that the demands of the sea have not changed since the days of the early Polynesian catamaran explorers and that however fashionable it may be to have a spacious and glitzy yacht, or a head turning racing cat, ultimately our vessels must be designed and built to cope with the worst weather nature can deliver. 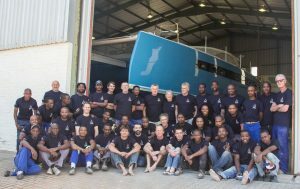 We are a team of pragmatic, serious sailors who believe that a catamaran that pounds too hard, or cannot sail smartly into the wind, or that can’t run swiftly and safely before a raging sea is simply not safe. In our view a catamaran that is not easily operated shorthanded, too complex to maintain and sustain, which cannot carry cruising payloads, or is too cramped to make life enjoyable defeats the entire purpose of voyaging. The Balance team has been listening very carefully to – and learning from – hundreds of catamaran sailors on the features they most want and need in a liveaboard voyaging catamaran. Careful notes have been taken and used in each design so that Balance Catamarans lives up to its mission of restoring harmony to bluewater catamaran sailors. After managing the sale of hundreds of catamarans over the past decade – new and used – we’ve learned how catamarans are built, visiting just about every major factory in the world, how they break and fall apart, how they sail in the most dangerous conditions, which systems tend to work and fail, and how they are “really” used by sailors. We’ve concluded that none of the catamarans currently offered by the major production builders are ideally suited to the needs, budgets, and performance expectations of today’s committed liveaboard voyagers. The catamaran market has simply focused too much on the charter trade and lost the ideal balance of performance, comfort, quality, and practical seamanlike features required by serious sailors. 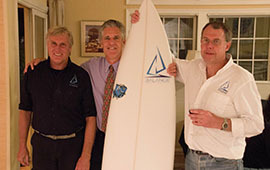 Balance Catamarans are unique because they were designed solely for liveaboard performance voyaging by Anton Du Toit, Roger Hill, Jonathan Paarman, and Phillip Berman in close collaboration. They result directly from the enormous fund of experience they have gained through sea trials, numerous builds and designs, owner feedback and the collective result of millions of blue water miles. There really is no substitute for experience and the direct relationships we have had, both individually, and with hundreds of catamaran sailors, has given us the invaluable feedback we’ve relied upon in the design of each Balance Catamaran that we build.